Hills and heat are not a runners best friend but that is what I faced in Halifax on Sunday. 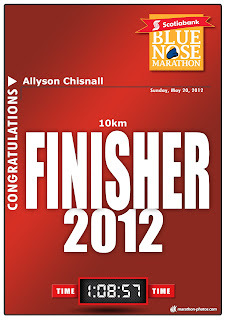 The Bluenose Marathon is usually a cool and/or wet event but not this year. This year we ran on a beautiful sunny hot day, a summer day we wish for all winter but do not train for. We start training in March or even earlier for the the longer events and it is still winter and early spring, rarely do we run in really hot conditions. Only in Canada do you train in one season to run in another so it is a shock to the system when you encounter your first really hot run. Sunday dawned with a glorious sunrise, I know as I saw it rise, and a steadily rising temp. By race time it was over 20C and the sun was shining, not a cloud in sight. I was trying to keep things cool, at least on the inside. It's just like any other Sunday training run I told myself, slow and steady and you will be fine. My goal was to help my friend Roy around the course in 75 mins but if at some point he was not feeling it, I would go and run my own race, hoping for a time under 70 mins. Around the 2k mark, Roy realized today was not the day and we parted company and I started running alone, as alone as you can be in a sea of 3300 people. We headed over the bridge to Dartmouth, the first of 2 bridge crossings and I was feeling fine, enjoying the view from the bridge, not enjoying weaving through the crowds of runners but trying to keep things slow and easy. I looked at my Garmin as I finished the bridge and it showed I did a 6 min km, way to fast for me for a 10k and I knew I would pay for it later but it sure felt good at the time. I steadily gained ground on the other runners, passing the 75 min pace bunny and then the 70 min pace bunny and started the bridge crossing back to Halifax, that bridge crossing was not as much fun but I did fine. As I headed off the bridge I was on pace for a 66-67 min finish and then I hit North Street or should I say North Street hit me like a ton of bricks. It was a short, very steep uphill, not very nice at the 8k point on a hot day and my early fast pace came back to haunt me. I almost came to a dead stop at the top of the hill but the people cheering keep me going but I was suffering. I took my finally walk break, draining my water bottle and set off again,so ready to be done this race. 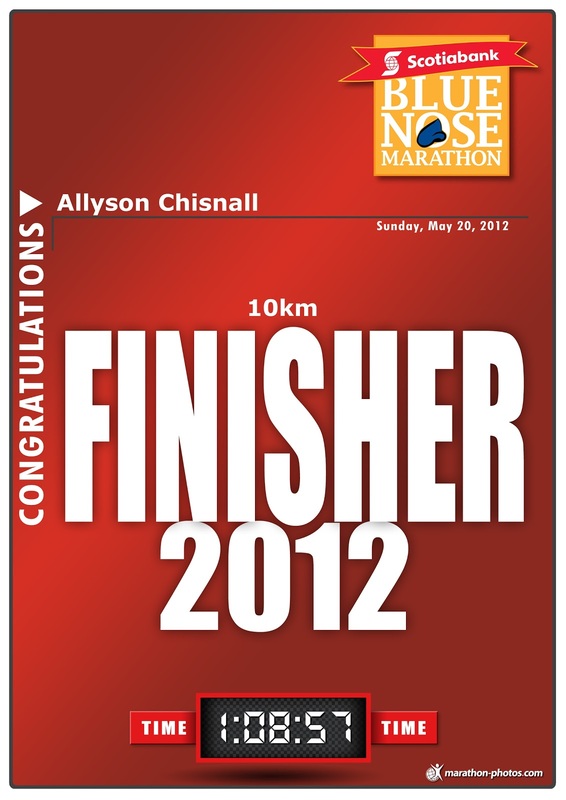 By the time the finish line was in sight, I had nothing left in the tank but I was not going to give up. It was not pretty and in a way I am glad they did not get a photo of me as I crossed the finish line but I did finish in 68:57, a new PB for me. The hills and heat in Halifax came close to beating me that day but as I am fond of saying "Close is only good enough in horseshoes and hand grenades"
Thats sums it up exacttly!!! great job!